Note: this is an archived entry. Some links might not still work, but I have tried to ensure scan and video embeds are still in place. If any linked material is unavailable, please let me know and I'll attempt to find a copy in my personal archives. 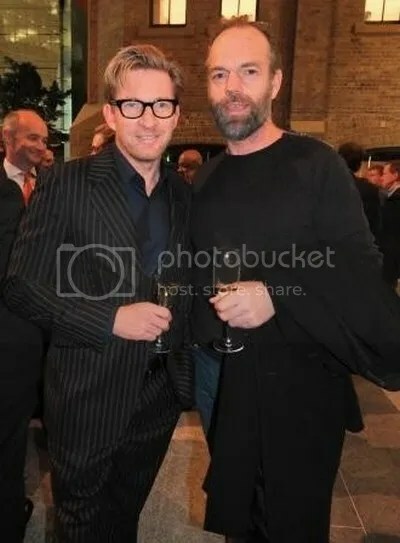 I knew that [Hugo and costar Josh McConville] were capable of doing it. How would you know otherwise? I'm only guessing here. Some people are really good at auditioning. They come in and they can be fantastic. 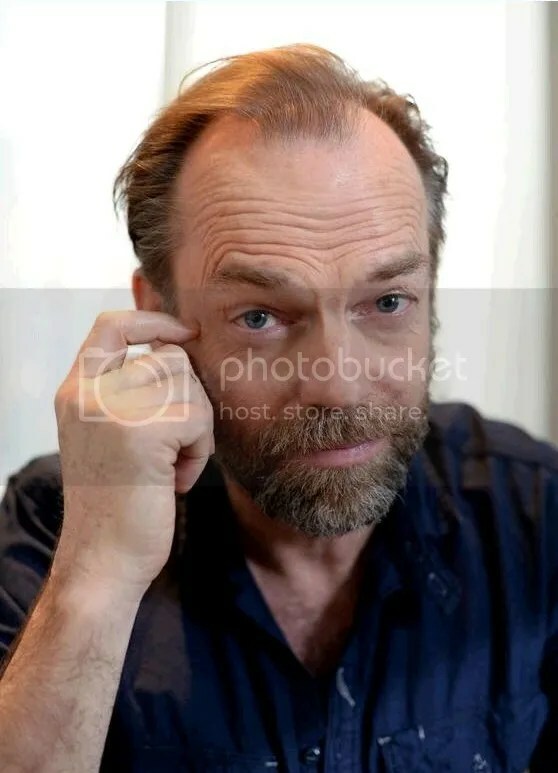 But those actors could also be the same actors that when they appear on set, that's all you're ever going to get from the performance. Sometimes, you want a performance to change. To do something other than what they're doing and they're not capable of doing that. So you want to be confident that your actor is malleable and can take direction and can change…. 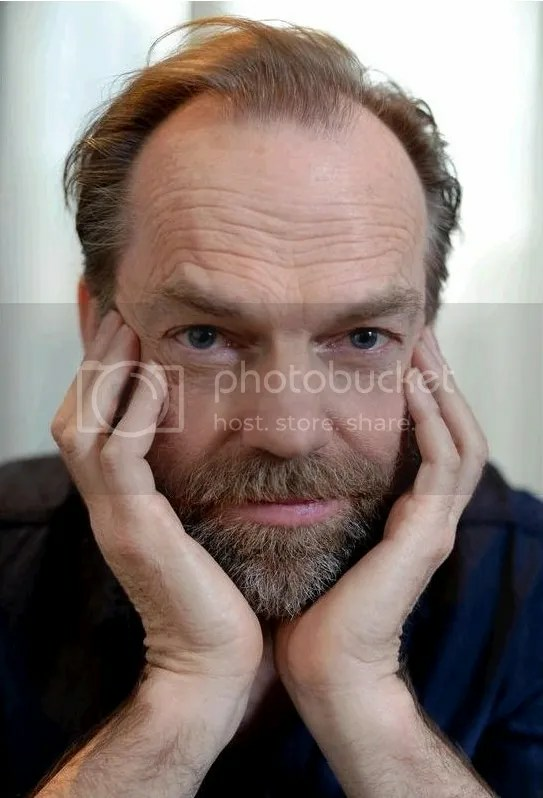 I'm more into performances that will actually move people or can change people or affect people in some way, as opposed to watching a performance and going 'Oh that's amazing, that's a really good actor.' That doesn't interest me at all…. I was lucky that The Commissionwas only a short film. It was manageable; there were only two actors in it. I purposely wanted to keep it very, very simple in terms of what I was doing with the camera. But I wanted to reflect Tim Winton's writing. For me, Tim Winton is very, very simple and sparse with his writing. There's nothing extraneous. I wanted to very clearly and simply get the kernel of truth within those two characters." The full interview can be read here, and includes an amusing tangent on Viggo Mortensen's Method-acting extremes on the set of Lord of the Rings. You can read more about the trailer at Sunrise on Seven/Yahoo, The Film Stage, Four Film Music, Cinema Blend and Mumbrella. There's been an encouraging amount of positive feedback worldwide on various social networks, so hopefully this will help the film earn the international distribution is deserves. The limited-run Australian special release (beginning September 26) featuring the full-length cut of the film and special appearances by various cast and crew members is quickly selling out; Australian filmgoers should book tickets at the film's website quickly. 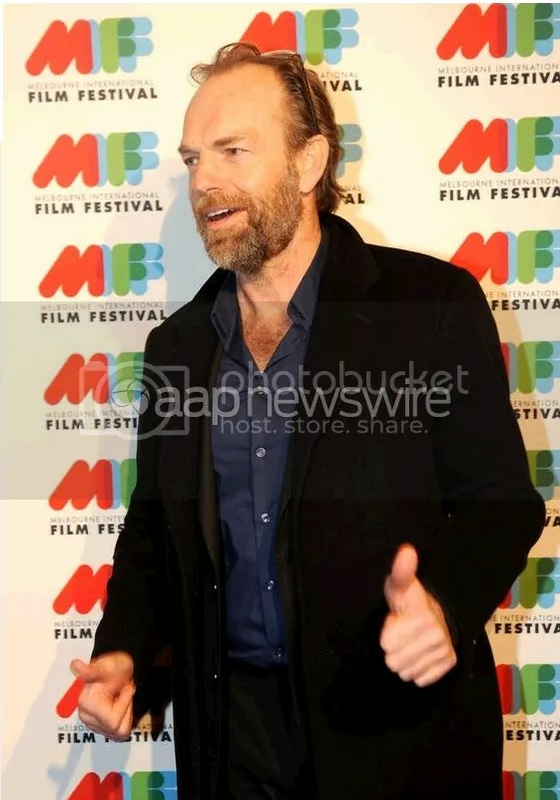 Producer Maggie Miles called in ABC Radio yesterday for a brief chat about her work on The Turning, including living "in a tent in the outback with Hugo Weaving, David Wenham and crew during filming of The Commission". You can stream or download the audio interview at ABC South West WA. Megan Lehmann, The Hollywood Reporter: "Portmanteau films can be frustratingly hit-and-miss affairs, but the powerful source material and the packed stable of top-tier talent involved in The Turning have resulted in a masterful, exhilaratingly coherent collage of Australian life in the raw. Based on acclaimed Australian novelist Tim Winton’s best-selling collection of 17 interwoven short stories, this eloquent three-hour epic offers a bracing, sometimes deeply unsettling, arthouse experience as individual plot threads twist and twirl and ultimately come together to form a composite portrait of small-town lives that are pinched yet somehow poetic…. Within a tight geographical focus on a fictional coastal town in Western Australia, different story strands confront police corruption, soul-deadening abattoir jobs, alcoholism and young love and lust. Certain characters recur during different stages of their lives, but in the film version, each is played by a different actor — sometimes Aboriginal, sometimes not — depending on the story in which they appear. It would take repeated viewings or a thorough perusal of the program to tease apart the links — or you could just go with the flow…. There is scarcely a misstep from here, although some segments are stronger than others…. 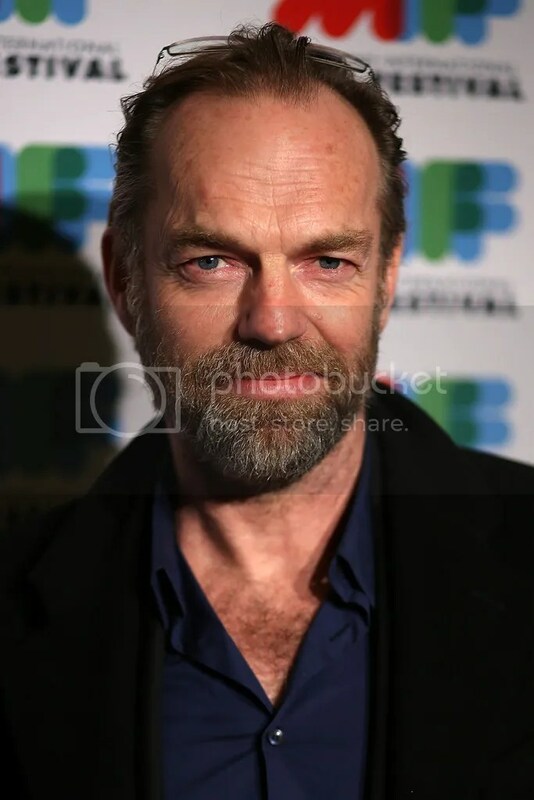 Hugo Weaving gives an affecting performance in Commission… The cumulative effect is transporting." Lee Bemrose, Soot: "There might be a temptation to compare this to projects like Kieslowski’s Three Colours trilogy or Robert Altman’s adaptation of Raymond Carver’s short stories for Short Cuts in that characters from one story make an appearance in other stories, but The Turning is so much more than these movies. And it is not one big movie or one big story; it is, perhaps, an exploration of the idea that our lives are actually made up of many stories, each branching off from another, even if we think of our life as a single story…. 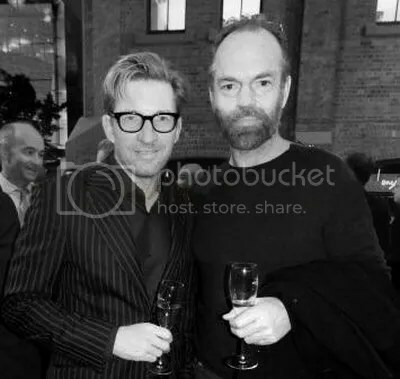 Actor David Wenham directed Hugo Weaving in Commission, and the result is so good in every way. It’s a slow, father-son drama that gradually shares the details of the past until we have the final picture of what is going on. Laconic, damaged Australian masculinity done to perfection…. Casting and performances were universally excellent. Whether seasoned veterans or young ones, they all had moments that allowed us to glimpse the very real humanity of the characters they were portraying. There are moments in almost every story that will break your heart in some way. It could be argued that if the movie requires a detailed program complete with timeline and family tree, it has not succeeded in being its own entity. I prefer to think that the program enriches an otherwise already rich experience. The Turning as a movie does stand alone, it does make me want to read the book. And it’s not often that I want to watch a three-hour movie again. It’s that good." The promotional material doesn’t lie: this really is a special event. Each ticket purchased will be rewarded with a 40-page glossy book that details each short for you to recollect for years after. The rare dull moments are superseded by some of the best cinematography from any film this year. Local audiences have been shouting with dry throats for a film that doesn’t portray us inside a medical facility or a police station. This may well be the answer for a lot of you. The entire country is represented in some manner for the first time here through a means that almost turns it into an artwork. Take advantage of this special offer in a cinema while you can—chances are we won’t see something on such a grand scale for a long time again. 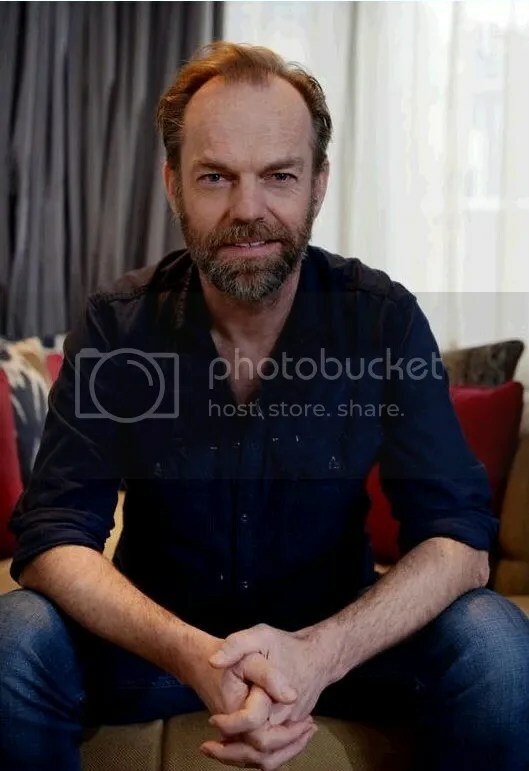 Producer Robert Connolly (The Boys, Balibo, The Julian Assange Story) has taken risks in his career. 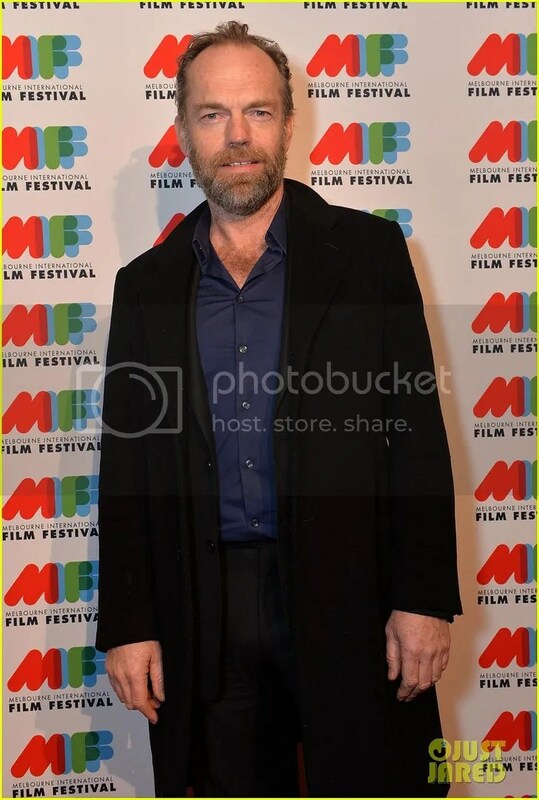 This is his most imaginative achievement to date, a huge punt on the collective talents of Australian filmmakers, young and old, established and still finding their feet. It’s a powerful work which will speak to Australians in a way nothing much has on our screens for years. I am wary these days of films which attempt to tell us who we are, but in some sense this does. Together, these stories make a world which is ours." Kewnton Bellette, Twitch Film: "I only disliked three of the 17 shorts in this compendium. For an adapted anthology this is an impressive figure…. The Turning is clumsily book-ended and has some misfires, but ultimately this ambitiously sky-high work deserves respect and recognition, fusing literature and film fiction effortlessly amidst a flurry of endearing talent." You can also view Bede Jermyn's lengthy, positive video review here; note that he doesn't begin discussing The Turning until 6.06 in. 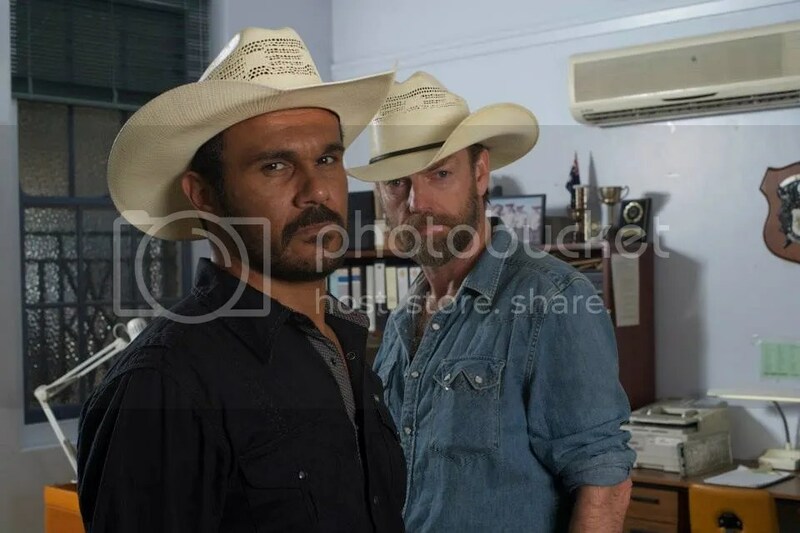 Mystery Road will also have a special gala screening to open the Darwin International Film Festival on 18 September, and will have a special screening in Winton, QLD (where it was filmed) in early October. I'll post additional screening dates as they become available. The film opens wide in Australia on 17 October, and in early 2014 in North America. Katerina Sakkas, Real Time Arts: "Like the best detective stories, it presents us not only with a mystery, but with an unfolding portrait of a particular community and place…. [Director Ivan] Sen emphasises the significance of [character] encounters by subduing background noise to near silence, with the result that faces and voices take on an almost unnatural clarity. Every exchange is a piece of the puzzle, and the viewer is encouraged to watch vigilantly. 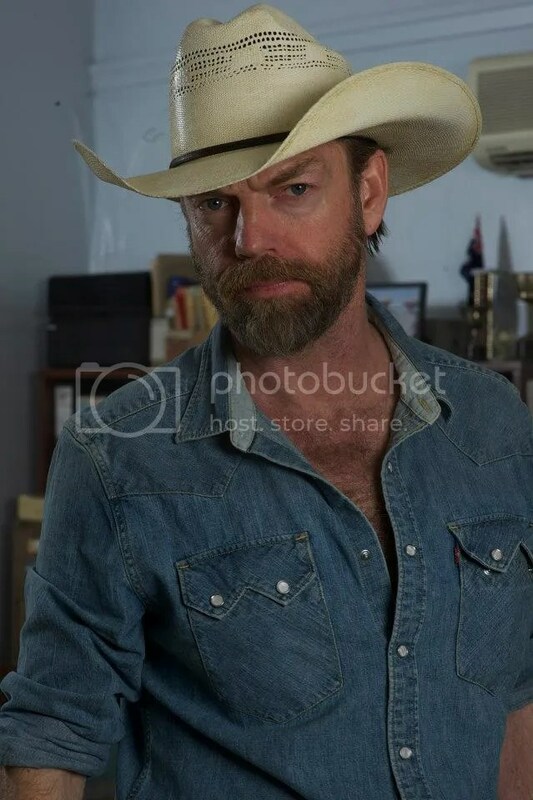 This wouldn’t work without the committed performances of Mystery Road’s cast, an impressive concentration of Australian character actors which includes Tony Barry, Hugo Weaving, Jack Charles, Tasma Walton and Jack Thompson. 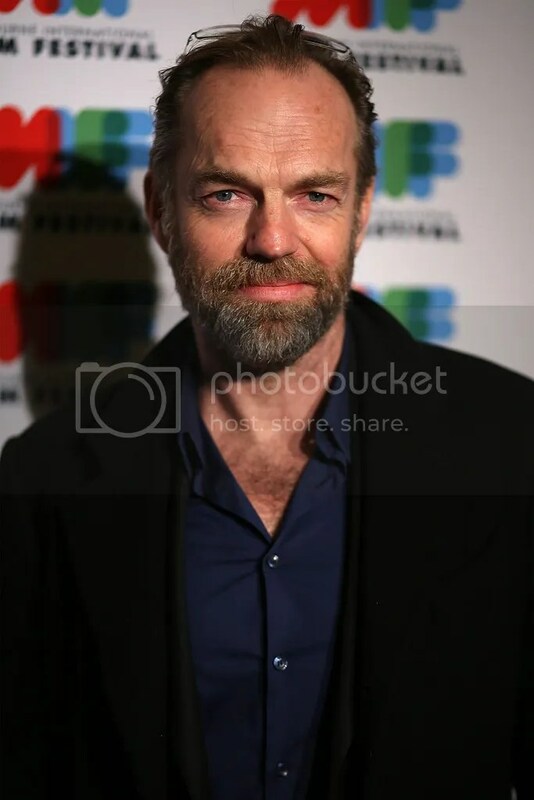 Pedersen leads them in a strong, understated performance as the conflicted Jay, a contained man whose gaze is constantly wary, but who also projects sincerity and dependability…. Where Mystery Road falls down slightly is in its function as a detective story. Every scene might be a piece of the puzzle, but not all of these pieces are put together at film’s end, particularly the portentous references to wild dogs which recur throughout but are never satisfactorily explained. Overall, however, Sen has employed the framework of the whodunnit to create a striking piece of cinema whose stylisation enhances rather than overshadows this story about a misfit cop probing a town with a rotten, racist core." 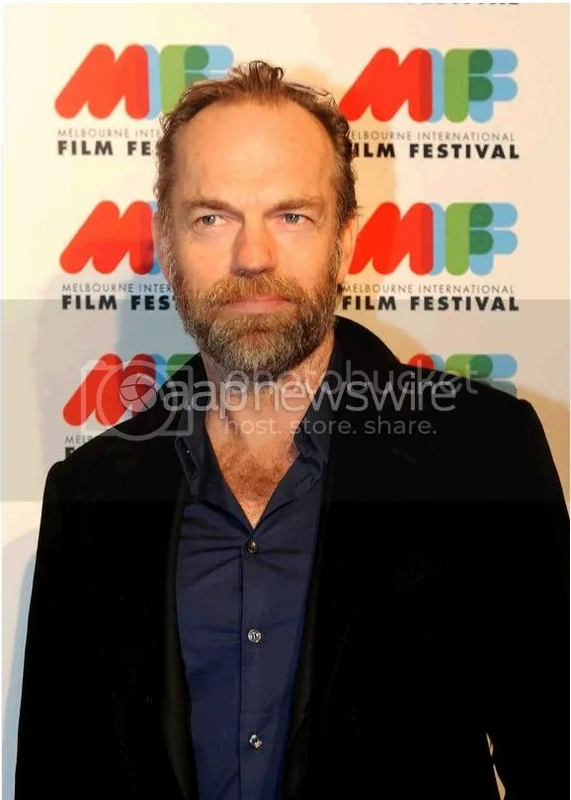 Hugo Weaving himself has kept a low profile in recent weeks, having apparently wrapped work on The Mule (I suspect his role might not be as large as initially advertised, but it's too soon to tell.) 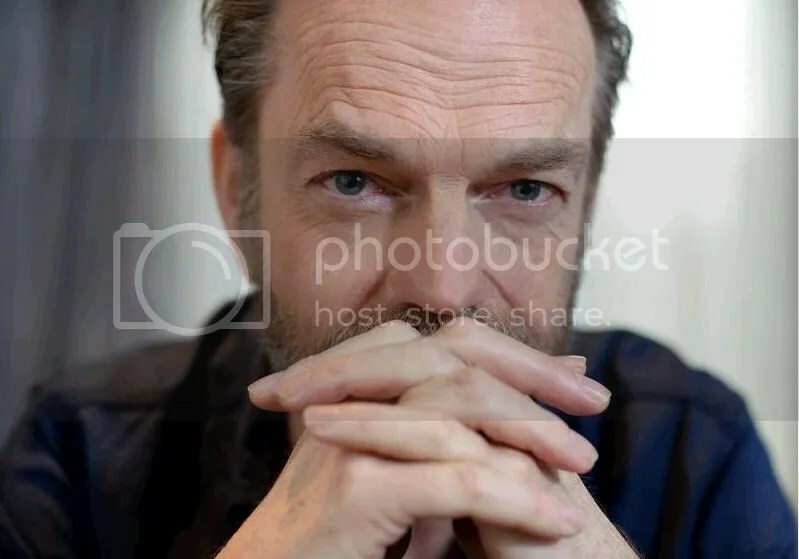 There have been various internet rumors and tweets about his working on formally unannounced projects including a voiceover on something called Manny Gets Censored, a film project involving Bryan Brown and a role in the film Shadows From The Sky. 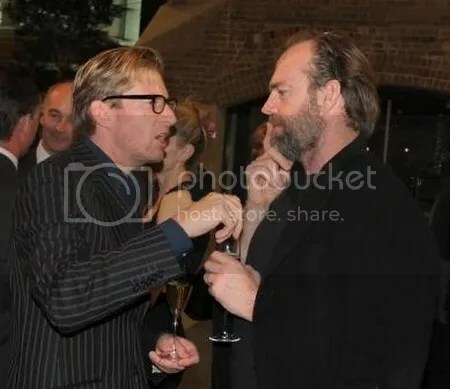 I suspect the last is a case of mistaken identity, as the only source is an actress who was signed on for the film but hadn't yet begun working on it when she was interviewed; early promo materials for Shadows list Hugo's LOTR castmates Sean Bean and Karl Urban as possible leads, but Hugo isn't mentioned anywhere on the film's promotional sites. 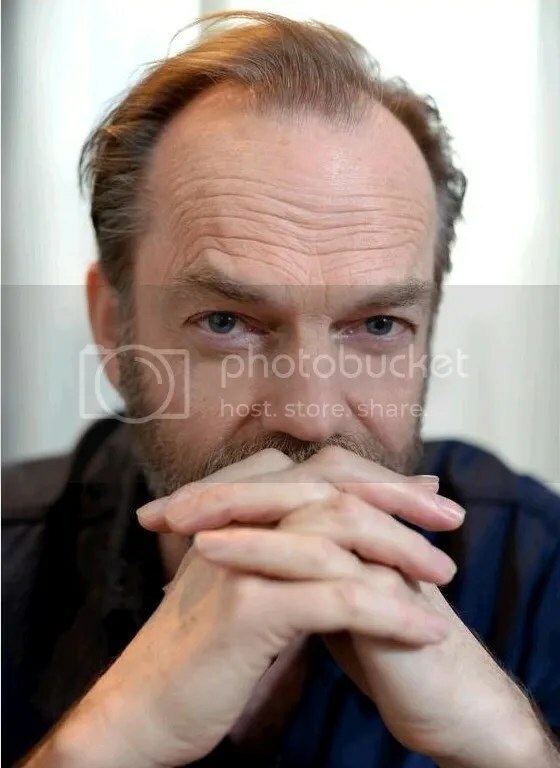 The other two projects remain in the "tantalizing rumors" stage for now, as I can find no information on them at all beyond the Tweets linked to. Hugo is also frequently spotted cheering on his favorite sports team at Sydney Swans games. So it looks like he's finally taking a well-earned break from films and film promotion for the moment. 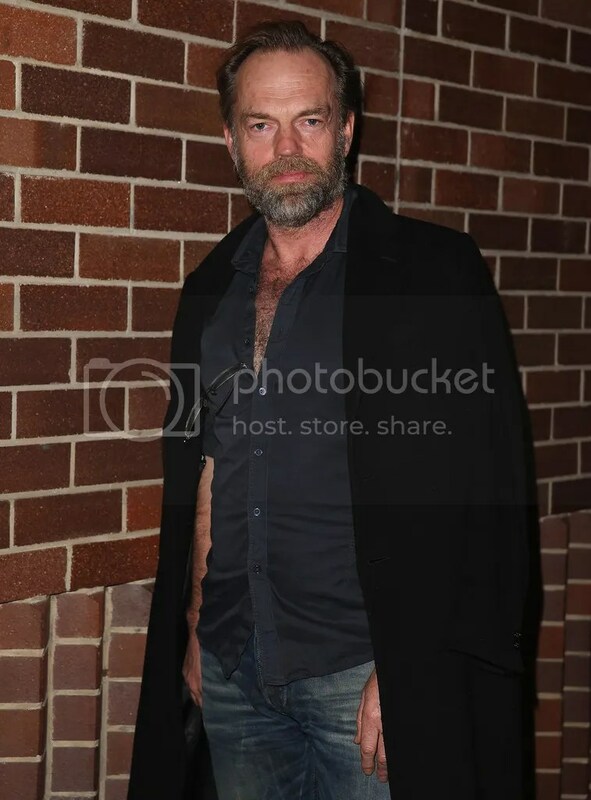 Although his role in additional publicity for The Turning and Mystery Road is unknown as yet (we know he was involved in some as-yet-unseen interviews for The Turning earlier this month) fans can rest assured he'll be back in the public eye at year's end, costarring with Richard Roxburgh in Waiting For Godot at Sydney Theatre Company. An extra week of performances were recently added due to overwhelming demand. A slightly shorter entry this time, as there's no breaking news to report. Response to multiple screenings of Tim Winton's The Turning at the Melbourne International Film Festival continues to be enthusiastically positive for the most part, with even those who didn't love every segment (or found the film too long) saying only positive things about the acting, ambition and cinematography. 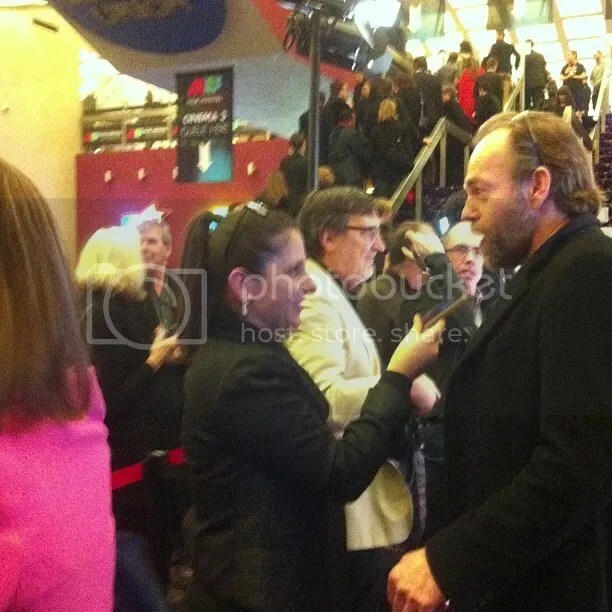 I'll post a few excerpts later, but first, some new photos. 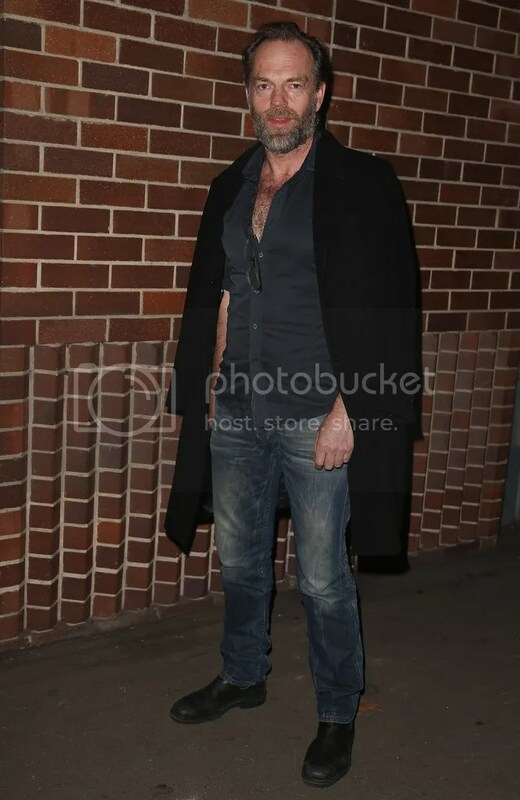 As I mentioned last time, Hugo stopped by the opening of The Local Bar in Sydney last week; the establishment is co-owned by several of his friends/fellow Australian entertainment legends, including Sam Neill and David Wenham. I posted the print version of the Daily Telegraph's coverage, including a nice photo of Weaving and Wenham; since then, a digital version has become available, so I'll share that here, under the cut, along with several other photos from the event. The film demands a lot from its audience but it has good intentions and more importantly the effort it demands is deserved. Connelly and the others attached to the project should be commended for creating such a unique visual experience for viewers. Like many Australians I tend to have a degree of cynicism—deserved or not—towards our film industry, so it is welcoming to be able to support a film that not only showcases numerous strengths in Australian filmmaking, but does so in such an elegant manner." Rochelle Siemienowicz, SBS: "To adapt the collection into a single cinematic event, let alone with each chapter made by a different team of creators and actors, seems a grandly ambitious goal. 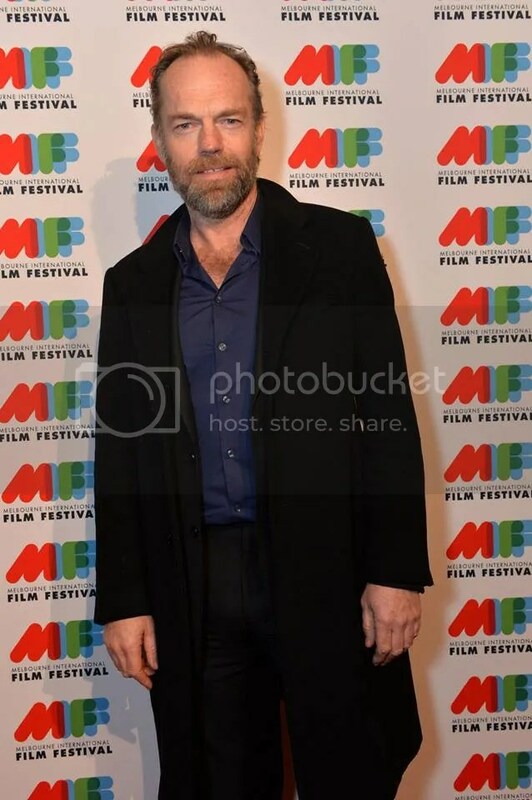 Yet the mastermind behind the project, director and producer Robert Connolly (Balibo, The Bank), has succeeded not only in bringing together surely the largest assembly of Australian filmmaking and acting talent ever involved in a single project, but also in producing a work that maintains a remarkably consistent tone throughout – one of melancholy, regret, and longing… That may be part of the problem – three hours is a long time to spend in the presence of such pain and ambiguity, without the swell of a forward-thrusting narrative to carry you through…. The cinematography, music, sound design and performances are uniformly excellent – and that’s not just code for ‘Australian dud’. But Connolly knows he’s asking a great deal of the audience, so he suggests we approach the film as a ‘group exhibition’… Does it work? Perhaps it’s best to give the final word to Winton himself, who writes in the program, 'Anyone mad enough to try it deserved a crack. And the result? Who can say? Not me.' He then doffs his hat – and so might we – to those who defy convention, 'in a time when filmmakers might be forgiven for simply conforming.' "
Tickets are now on sale of The Turning's's special, limited-engagement Australian run, which will include the full 3-hour, 18-episode cut and 40 page booklet, via the film's website. Still no specifics on international distribution yet, but I hope too many compromises aren't made. “The Turning is a mesmerising, shocking, suspenseful and quirky film collage of short stories. Although it runs for a lengthy three hours it’s fairly seamless and you won’t want to miss a beat…. Certainly, acquiring a phenomenal cast of Australian actors has helped Connolly’s vision. 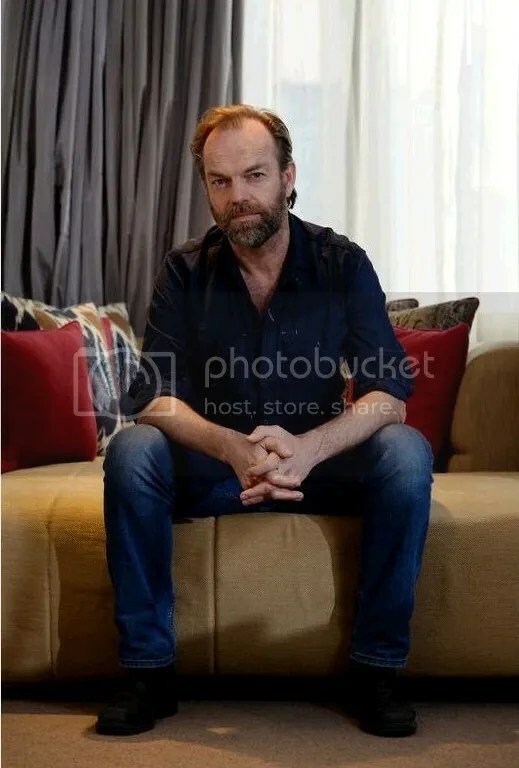 Big names such as Cate Blanchett, Hugo Weaving, Rose Byrne, Miranda Otto, Richard Roxburgh and Callan Mulvey lined up to work on the project. I found the acting to be unflinching, hard-hitting and effortless from the entire cast. 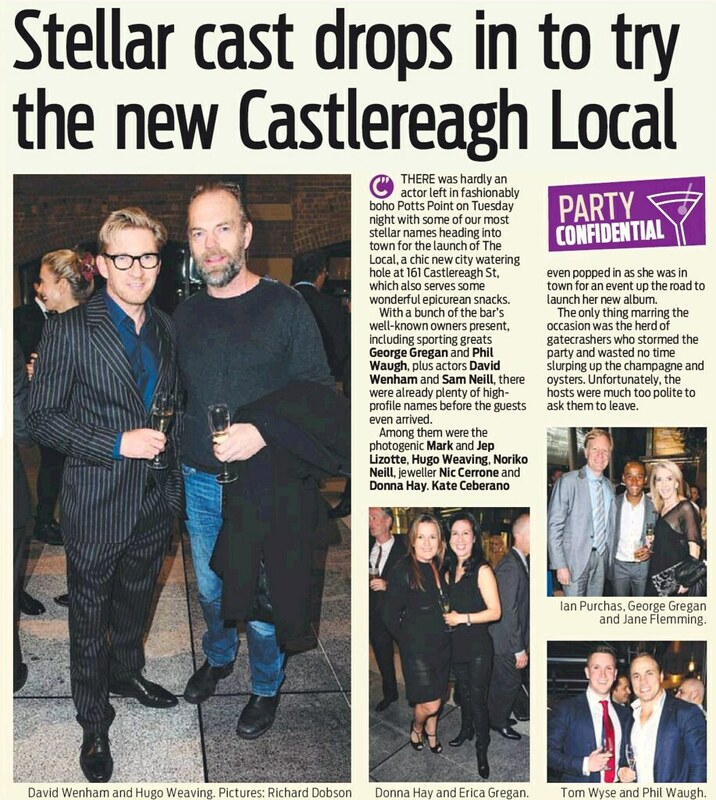 Finally, Hugo put in an appearance August 7 at the opening of a new pub called The Local at Castlereagh St in Sydney. 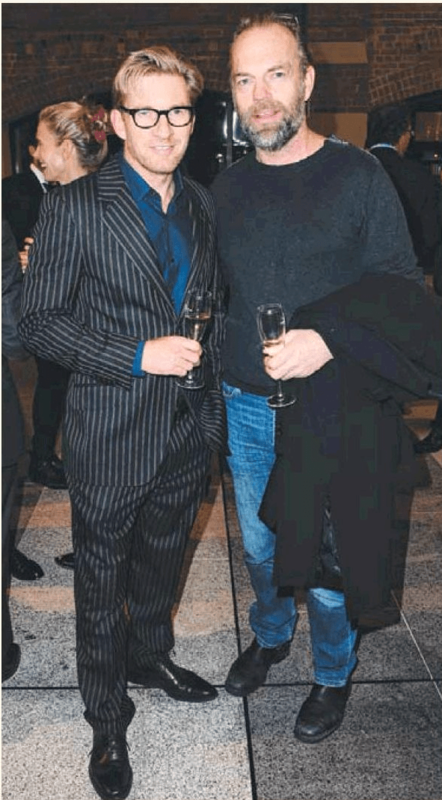 The establishment is co-owned by old pals (and frequent collaborators) Sam Neill and David Wenham. 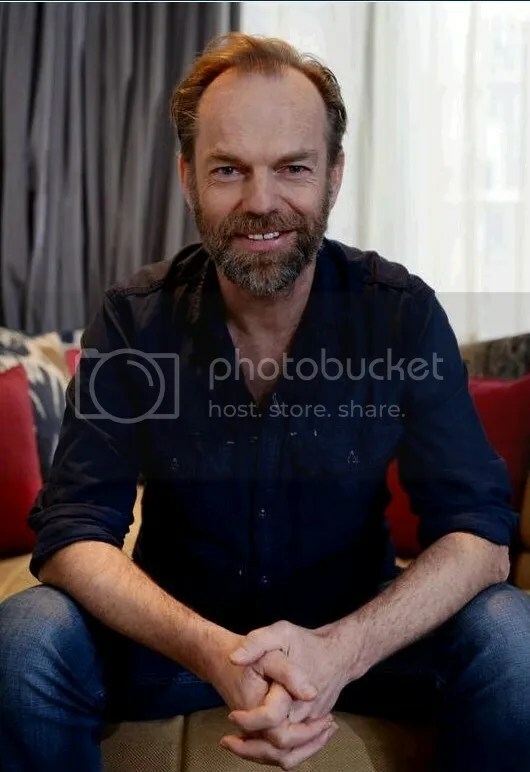 Hugo and David posed for a photo, and Sam Neill shared a photo of all the owners (and their significant others) on Twitter. Daily Telegraph’s coverage is below the cut. I’m still trying to find a higher-res/online version of the image; so far the article has only appeared in print editions. Best part is, he’s definitely wearing a clip-on microphone in some of these, so the fun might just be starting. 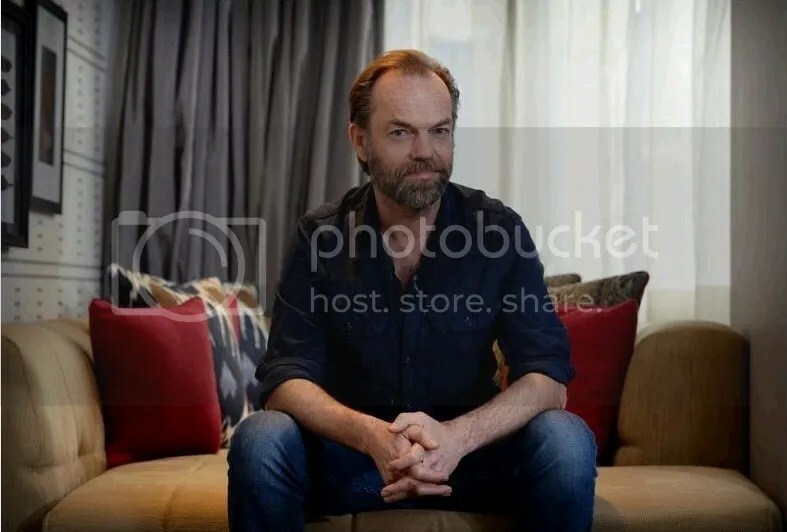 Hugo’s probably taping some promotional interviews for The Turning to coincide with its special release in Australia September 26. More as soon as it becomes available! 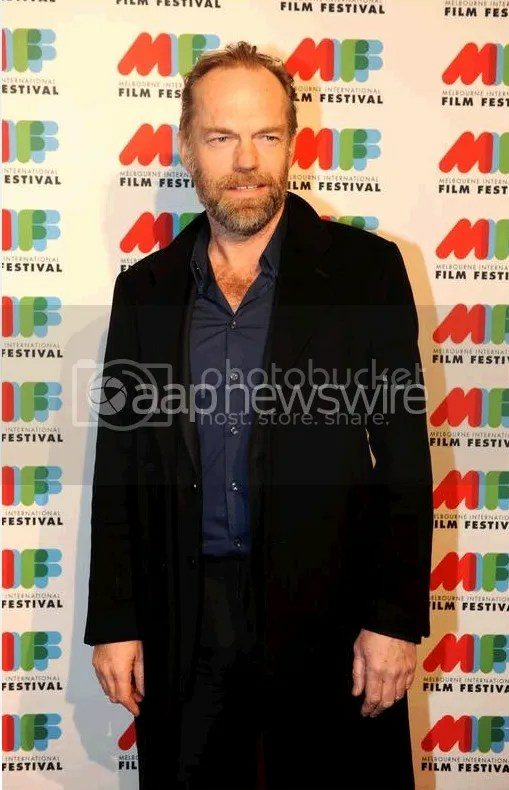 I'm rather disappointed to report that so far absolutely no video interviews with Hugo Weaving from the MIFF Turning premiere have been posted online since the event on August 3, and only one formal review (a very positive one, from The Guardian) has appeared. There were several raves on Twitter (including a few from Australian critics) immediately after the screening, so I'm guessing that either the film is so intense or complex in scope that viewers are taking their time putting together reviews– that or they're simply waiting for the film's Australian wide release next month. 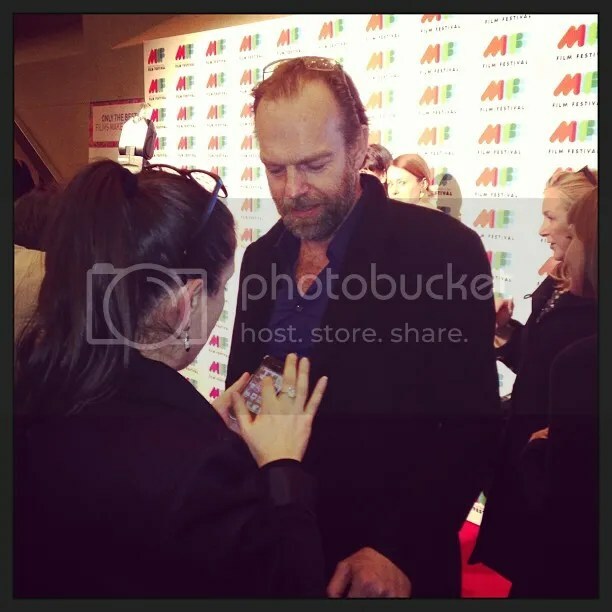 There has been only one red carpet video from the MIFF Turning premiere, from SBS; Hugo Weaving is seen briefly near the beginning (and is seen in the queue to get in with Katrina) but, strangely, no interview footage was shared. The video seems to focus on the film's aboriginal directors and stars, so maybe that's the reason. 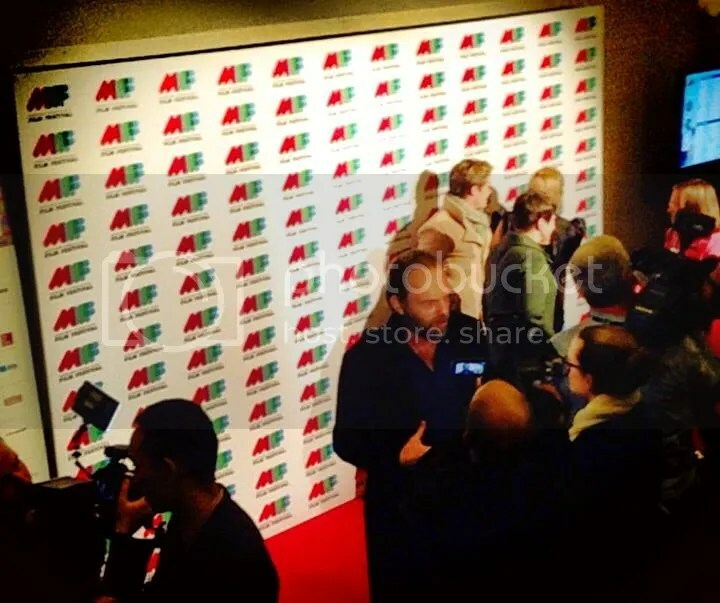 (The other international star at the premiere, Mia Wasikowska, also wasn't interviewed in the clip.) 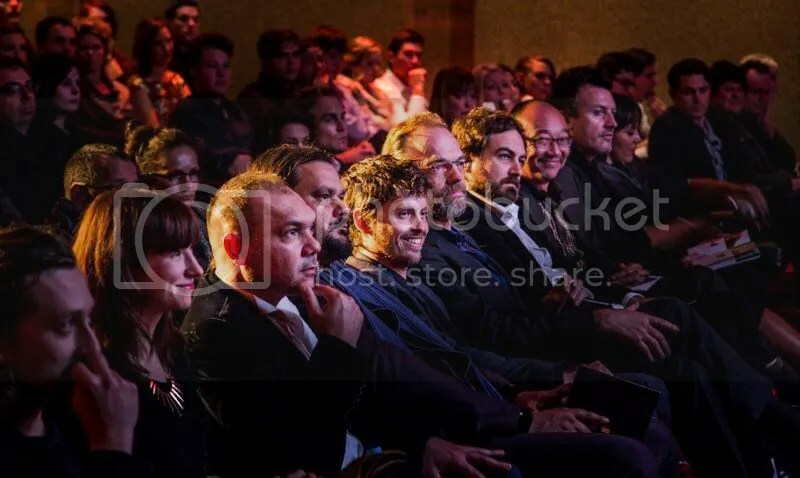 SBS shared both long and short clips of their video coverage of Mystery Road's Sydney Film Fest back in June, so maybe they have more they'll post later– I hope so anyhow. 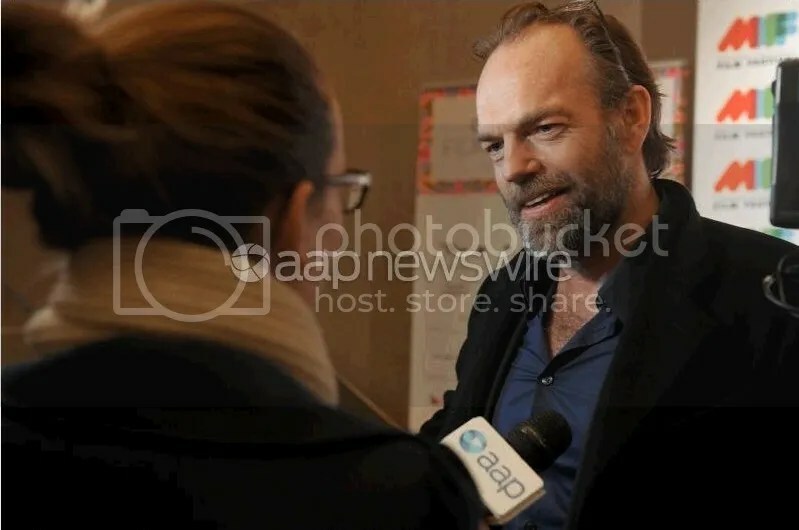 I know from photos thatat least four reporters interviewed Hugo at least briefly– I don't know if that footage is being reserved for a later date, or if it only appeared on Australian TV. We'll have to wait and see. 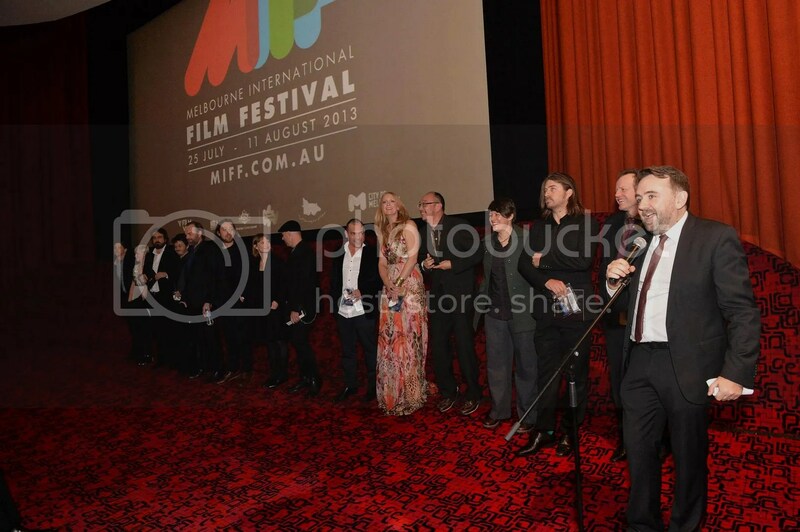 The film's directors (minus David Wenham, who's acting in The Crucible); producer Robert Connolly introduces the film. Hugo is fourth from left. Jim Poe, The Guardian: "The idea of such a curated project is noble, but it wouldn't be worth much if The Turning didn't work as feature-length entertainment. Omnibus films often feel like the cinematic equivalent of a meal of cocktail hors d'oeuvres; one of the achievements of The Turning is how well-crafted, cohesive and satisfying it is as a film. Despite its sprawling ambition and daunting runtime, it's surprisingly light on its feet – engaging, entertaining and frequently mesmerising throughout, with only a few missteps along the way. It also effectively recreates the experience of being sucked into a top-notch short-story cycle by a gifted author. While most episodes here would stand alone, it's hard to recall another omnibus film with such narrative unity. Characters re-appear in different episodes at different stages of their lives, fleshed out in snapshots that explore recurring themes from different angles. In that sense it works a bit like a TV series, where different creative teams adhere to one master vision (with Connolly as showrunner, perhaps). The different disciplinary approaches and mixed media generally keep things fresh and interesting. It's also a beautifully, unapologetically Australian film, imbued with the rhythm and detail of life in the remote coastal towns and hinterlands of Winton's home in Western Australia…. Like the best pieces here, it succeeds by avoiding the precious, one-dimensional quality of so many short films; it trusts the audience enough to present a tantalising glimpse of a fully-formed dramatic world. Most episodes are strikingly open-ended; the same characters are played by different actors, often of different races, creating a dreamlike quality." "The Turning" was amazing. Best movie that I have seen since Snowtown. 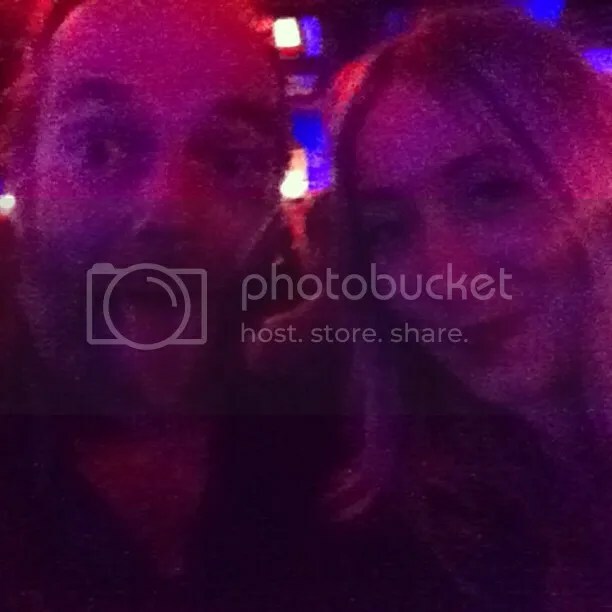 Best chapters were Rose Byrne's and @dougie_baldwin ! WOW @TheTurningMovie is fan-bloody-tastic. One small complaint only: shortest three hours of my life. Huge congrats to all. 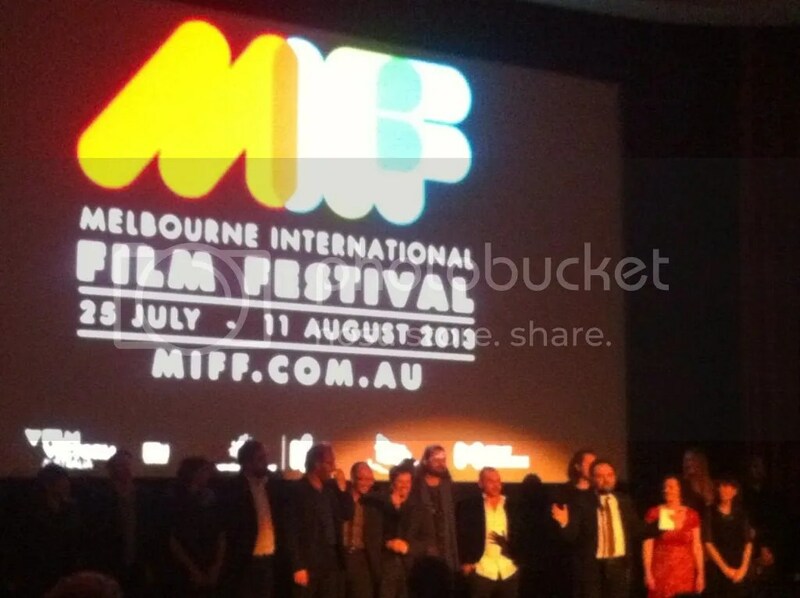 @MIFFofficial loved The Turning – wonderful cast, directors, and the centrepiece gala party was fun too. Loved it all. The Turning was magnificent last night. So impressed with Aus film right now. 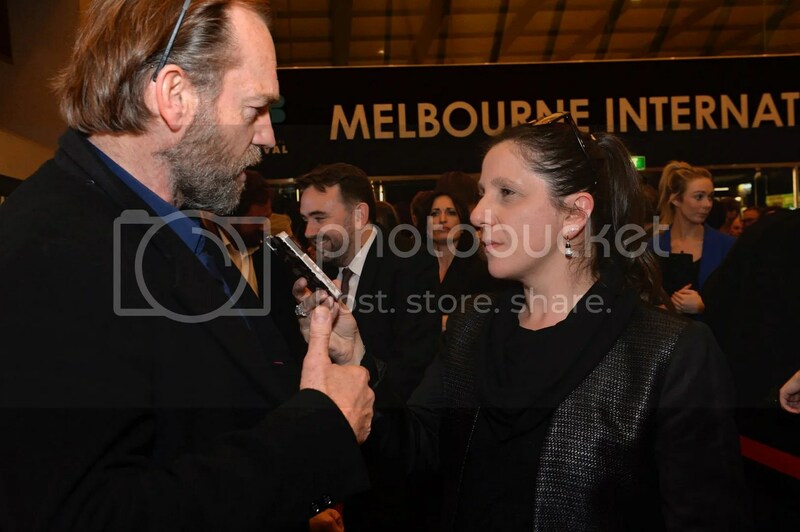 Am also tipsy in the back of a lot of Hugo Weaving interviews. 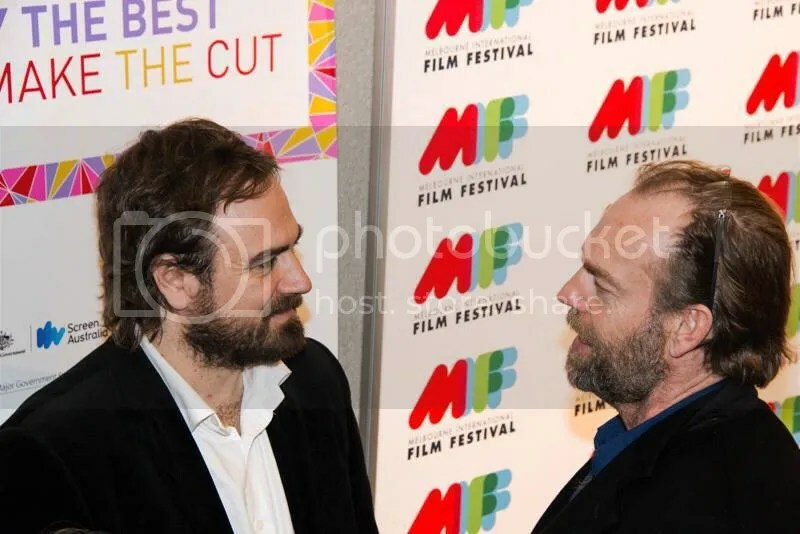 In Other Hugo News: Both The Turning (actually, an abbreviated version featuring the West Australian-shot sequences, but it does feature "Commission") and Mystery Road will screen at Cinefest Oz (The Turning on August 24; Mystery Road on August 22 and 25). 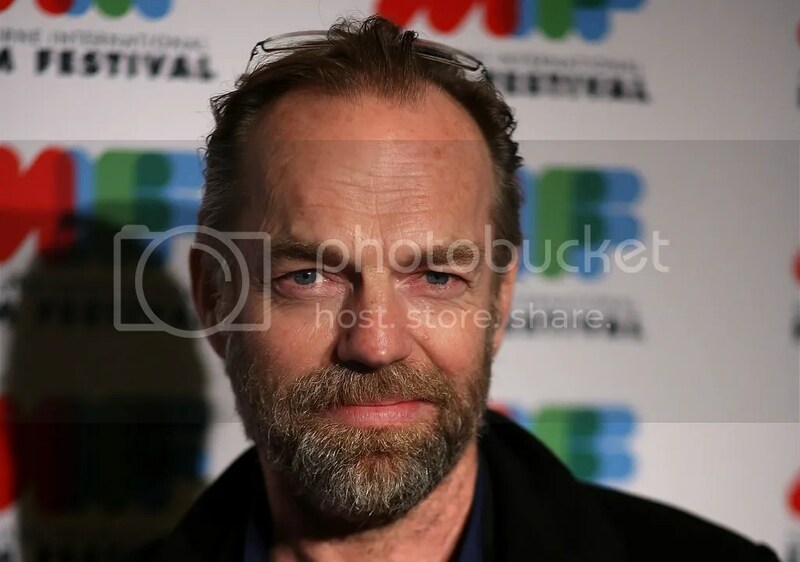 Hugo Weaving and David Wenham fans at Cinefest Oz will also have an opportunity to see them in the short film "No Budget", which will be shown in a Free Community Screening with the documentary Music of The Brain. More info here. And the Sydney Theatre Company blog features some great photos from past productions (including Hugo's plays Uncle Vanya and Hedda Gabler, and many more featuring Cate Blanchett) in their profile of lighting designer Nick Schlieper. UPDATE August 6: Screen Daily has posted a new review of The Turning, which, like The Guardian's, is complex but mostly positive, and stresses the importance of seeing the film in cinemas. Excerpt below. 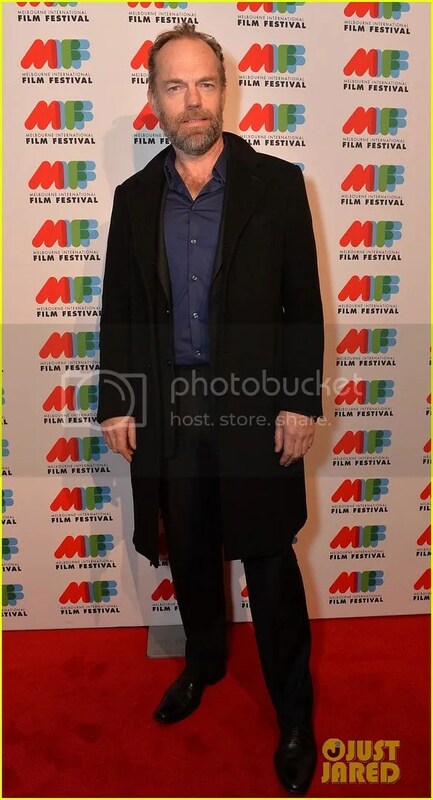 Also, I've added three new pics of Hugo at the MIFF premiere of The Turning under the cut with the previous batch, and I thank The Turning's Facebook page and Twitter staff (and MIFF) for sharing them. Australian fans will want to see the three hour, full edit of the film during its limited engagement starting September 26. (Another early screening, at Luna Cinemas, Leederville on 16 September, was announced today. Rob Connolly and Tim Winton will be present.) There have been many hints that the wider release of the film (and international release) will be edited, and, of course, won't feature all the lovely extras like booklets and in-person filmmaker appearances. (Well, maybe TIFF will be an exception.) 😉 Also, Tim Winton's source book is readily available in most international markets in case anyone wants to get acquainted with the Lang family before seeing so many different versions of them. Frank Hatherley, Screen Daily: "Connolly’s vision was for each team to have total control of the interpretation and presentation of their segment. This means that the central Lang Family characters — Vic, Gail, Bob and Carol — are played by different actors in each of the stories in which they appear. This can be confusing — sometimes they can be aboriginal — but will be less of a problem if your glossy programme sets you right….Also varied are the directorial styles — from dialogue-filled naturalism to voice over memories and part-dreams. There’s even a mute, studio dance segment, quite a challenge at the 150-minute mark. Crucially, there are many marvellous locations — vast plains, dripping swampland, impenetrable ranges, pounding oceans — the background to Winton’s acclaimed fiction over the years. Of the internationally known actors on show, Rose Byrne shines in a ‘trailer trash’ portrait (in Claire McCarthy’s The Turning) very different from her usual work; Cate Blanchett and Richard Roxburgh play Gail and Vic dealing with his difficult mother on Christmas Day (Reunion, written by Blanchett’s husband Andrew Upton and loosely directed by fast-rising theatre man Simon Stone); Hugo Weaving is Bob tracked down by his son after many years isolated in a remote tin shack (Commission, written and debut directed by actor David Wenham)…. It deserves to be seen, with all its challenges and bold complexities, on a cinema screen." 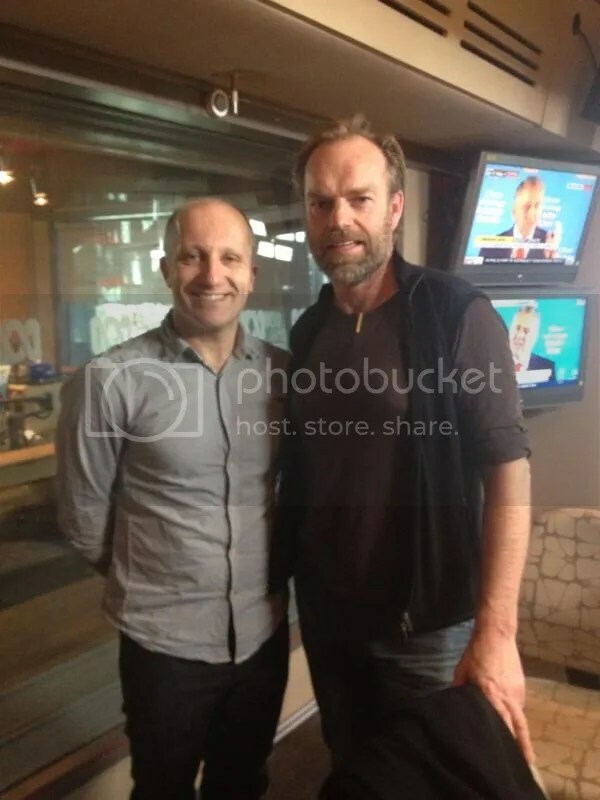 While we await the first images from tonight's MIFF Centerpiece Gala premiere of Tim Winton's The Turning, there's already one new Hugo image to share, from his promotional visit to 774 ABC Melbourne yesterday afternoon. Alas, there was very little advance notice for the interview, so I missed the live broadcast. ABC is usually very generous about sharing taped interviews (and the station does have a video page…) so we'll have to hope they eventually post audio or video on their webpage or Facebook page. If any other fans out there managed to record the interview, please let us know! 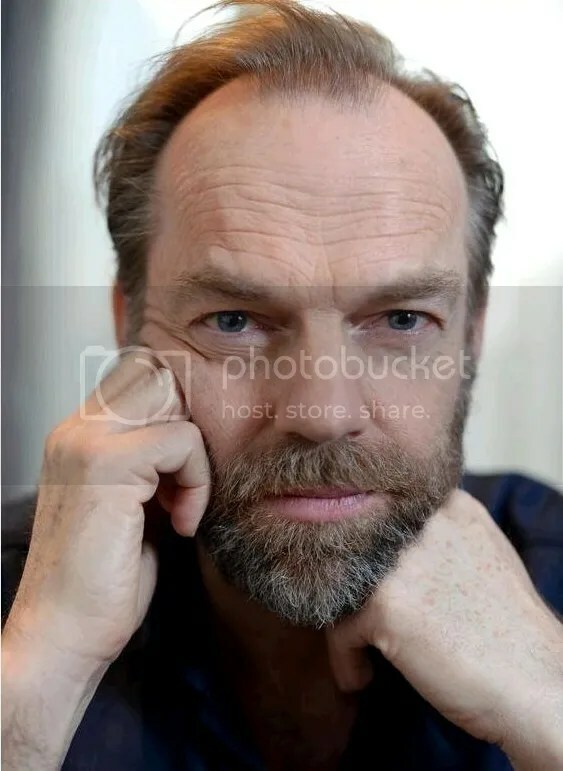 (Rather astonishingly, Elisa at Random Scribblings seems to have missed it too– usually if one of us doesn't catch something, the other does, but in this case, the station seems to have announced the interview literally as Hugo was walking into the studio.) 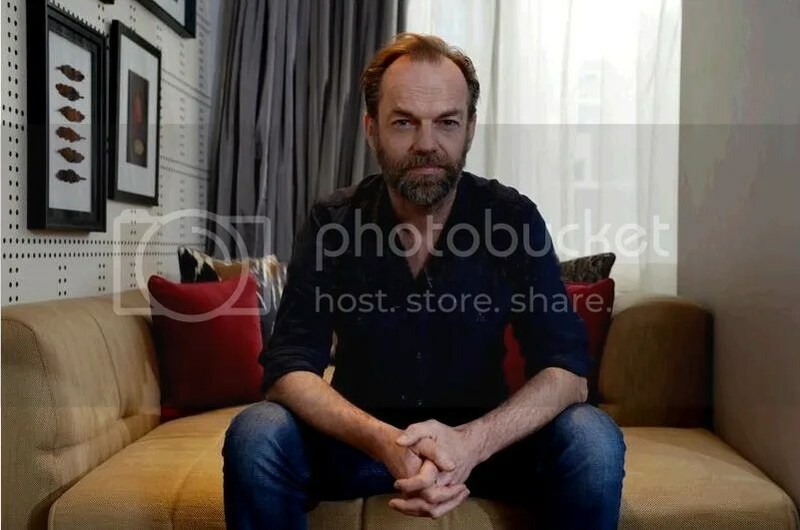 Since this is Hugo's first interview promoting this film, I'm particularly curious about it; I hope he'll give a few others in the hours to come. Hugo is due to attend the red carpet premiere of The Turning, which is now underway; I'll start posting photos as soon as they appear. 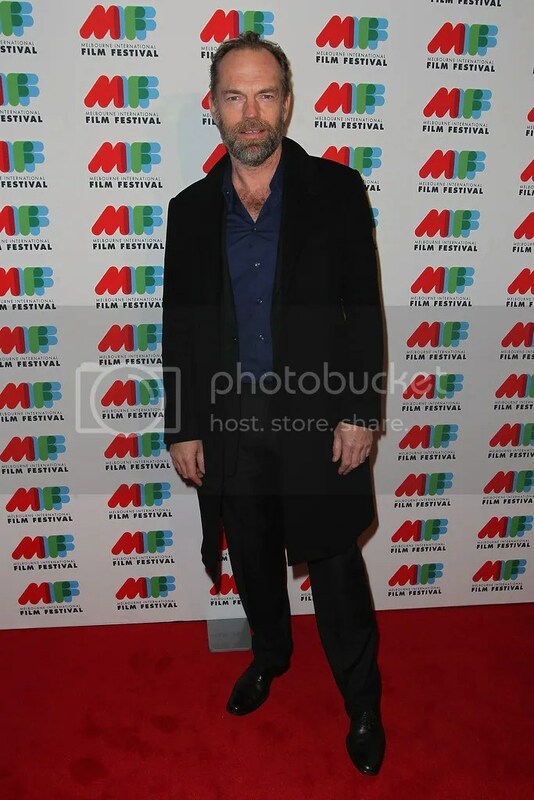 While we're waiting, I'll post some new links with details on the film's Cinefest Oz screening. 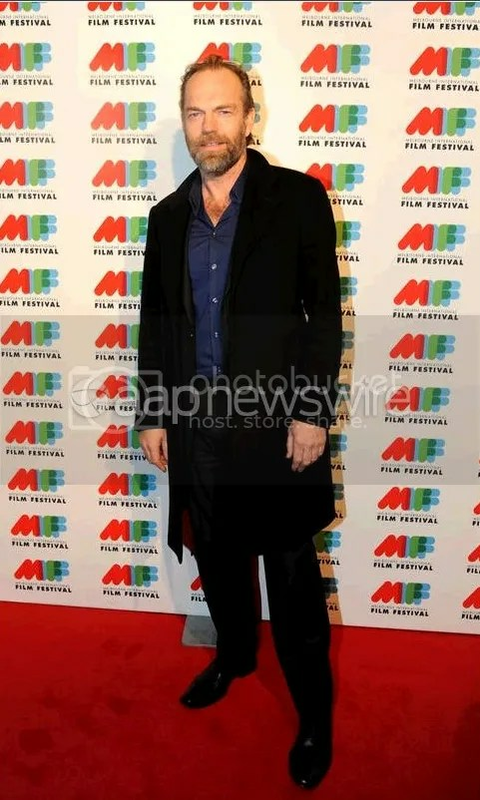 Hugo isn't scheduled to attend that premiere, but since Mystery Road and The Turning (and a slate of other intriguing Australian and international films) are both on the festival's schedule, fans in West Australia will definitely want to check it out. You can read more at Yahoo News Australia and Cinefest Oz's website. Mystery Road costar and screen legend Jack Thompson is on the guest list, and David Wenham and producer Robert Connolly will be on hand to discuss their film in a post-screening event; Wenham is also a festival patron, so his fans should get the kind of mileage out of that festival that Hugo fans got out of the Sydney Film Festival. Here's the print version of the Weekend Australian's preview of The Turning, featuring interviews with producer Robert Connolly, author Tim Winton, David Wenham and some of the other directors who worked on the project (and some film stills, including the one of Hugo by the campfire. And yes, some of the actors are posing with the ice cream. 😉 So far not Hugo, but he's probably too busy fielding questions from reporters. The film seems to be underway now, and since it's three hours long there'll be a bit of a wait for initial reactions. So far there haven't been any press photos of the red carpet posted online, but that'll probably change in the hours to come. I'm going to have to make accommodations for work and sleep at some point 😉 but will post updates whenever possible. We're getting our first press photos… and some very nice ones too! Unfortunately, a prior commitment kept Wenham from attending the premiere. 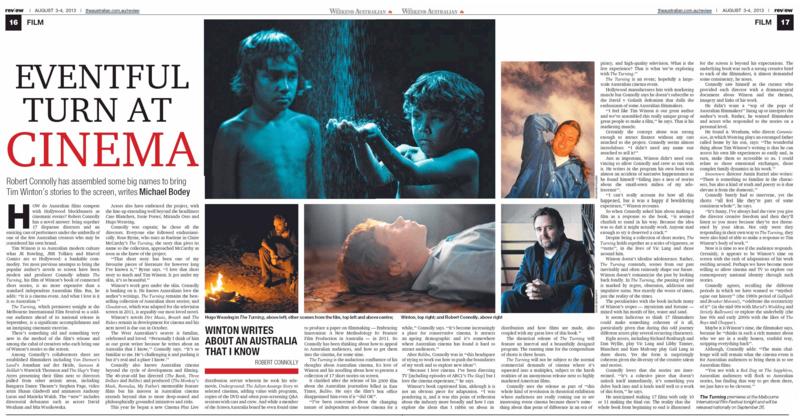 The AAP article also includes comments from Tim Winton, Rob Connolly and Mia Wasikowska, who directed one of the segments. 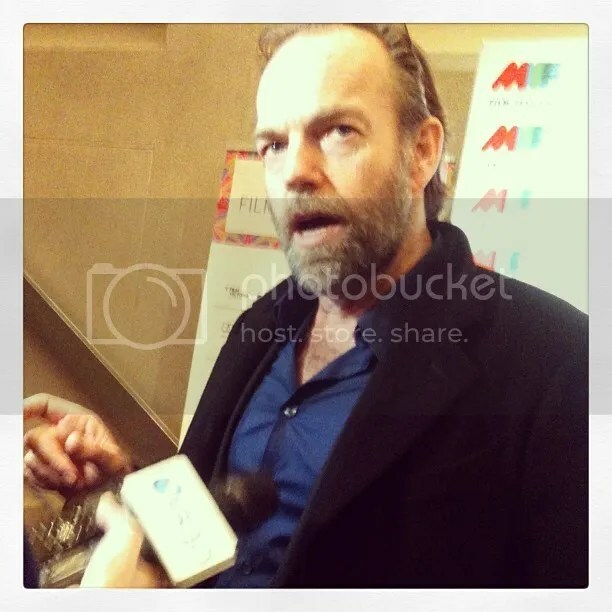 "Hugo Weaving is lovely!! Massive Matrix fan girl moment last night at The Turning Gala! He said he'd tell Carrie Ann Moss I had the Trinity doll still in its box unopened since I was 12 -next time he sees her haha. I complimented him on his incredible voice. He said I wasn't the 'usual' Matrix fan haha. Having a selfie with him was my mission last night & I did it haha. Shame it's so dark. Oh well, what a guy! 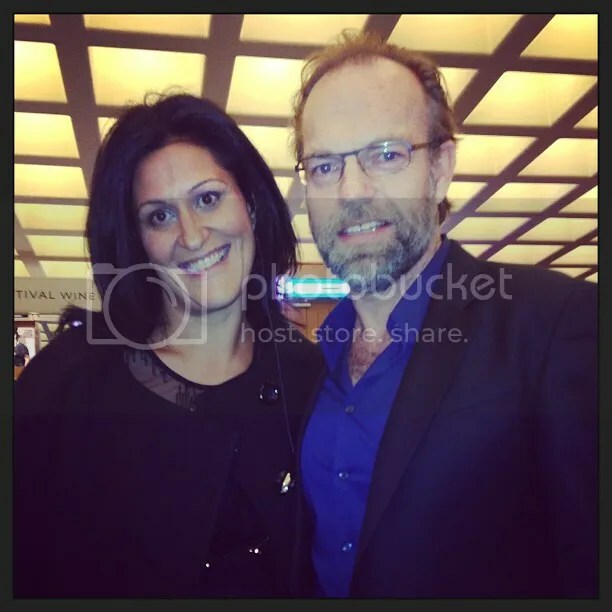 ‪#‎hugoweaving‬ ‪#‎thematrix‬ ‪#‎trinity‬ ‪#‎memorabilia‬ ‪#‎fan‬ ‪#‎famous‬ ‪#‎aussie‬ ‪#‎actor‬ @MIFFOfficial ‪#‎miff‬ ‪#‎melbourne‬ ‪#‎melbournelyfe‬ ‪#‎mission‬ ‪#‎accomplished‬"
I'd have to agree she isn't your typical Matrix fan… most typical Matrix fans don't know The Turning exists (let alone putting in the effort to attend the premiere), and too many don't know that most of Hugo's films are actually Australian indies in which he plays human beings. 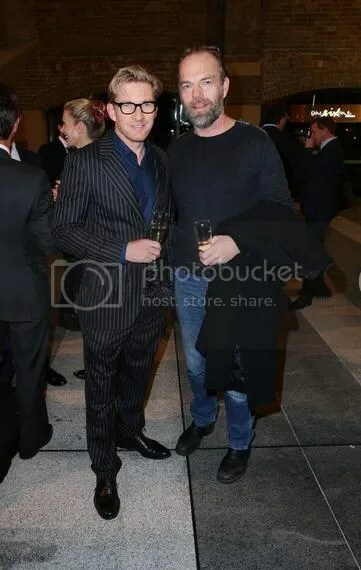 😉 Don't know that Hugo hangs out with Carrie Ann Moss that much, but he did meet up with Keanu Reeves in China last year, so it's possible they all keep in touch. She's been in several great (and criminally underseen) movies since The Matrix films and costarred on the short-lived CBS series Vegas last year. Fan photos with Hugo rarely turn out perfectly because nerves are such a factor. Or because one's boyfriend says something completely inappropriate while snapping the photo (not that I know anything about that, heh heh…) But they have a special energy to them that glossy press photos often lack.